I'm going to make this quick tonight. I spent the afternoon at the doctor getting checked because I've had congestion for weeks and weeks. Verdict is I have a sinus infection. Tonsillitis. And the beginnings of an ear infection. Joy. And now I'm on some many medicines, I can't think straight. Plus, it's only 8PM, and I'm ready to turn in. But you don't want to read about that. 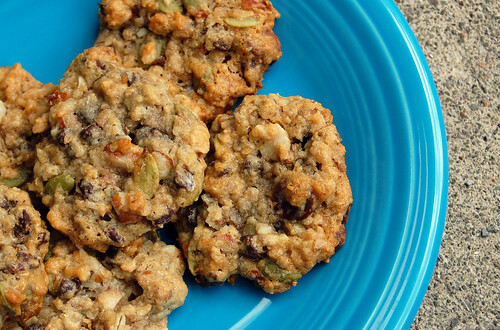 You'd rather check out these healthy vegan cookies! From the METHOD archives . . . I've been trying my best to eat healthy foods and cut out sugar. Not entirely, of course, but as you can imagine, an avid baker likely eats a tad too much of the stuff. I was craving sweets this weekend, and hadn't made a good vegan cookie in a while, when an oatmeal cookie recipe caught my eye in one of my hand-me-down cookbooks. I made like a million substitutions to make it healthier, so I hope you'll enjoy it! 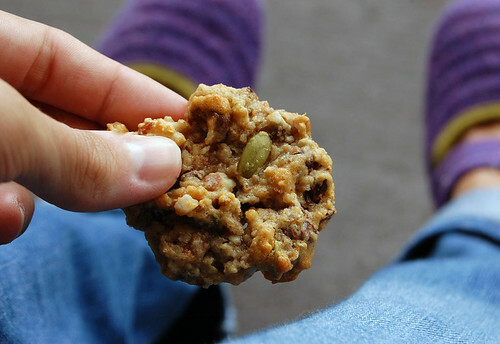 In fact, for our "fuel" on Sunday's long run (up to 15 again this week), we used these tiny cookies to up our glycogen. What's also interesting about these little suckers is how TINY they are. I've never made a sweet so small. So, you can eat three and it only equals one of the "normal" cookies I usually make. Cream together sugar and vegetable shortening in the bowl of an electric mixer on medium speed. Add agave syrup and soy milk. Beat well. Mix in the applesauce and vanilla. Add multigrain cereal. Mix well. Add carob chips, chocolate chips, pumpkin seeds, and raw peanuts. Mix well. Cover and allow to stand for 20 minutes to absorb moisture and flavor. Drop by heaping teaspoonfuls 2 inches apart onto ungreased cookie sheet. Bake for 11 to 13 minute or until lightly browned. Cool for 1 minute on cookie sheet before removing to a cooling rack.